Production version scheduled to be produced in the second half of 2019. Design is a nice blend of supersport styling with a hint of steampunk elements. Features a new instrument console, LED headlamp and tail light. Shares the frame with its naked sibling, the Brutale 800. However, the subframe is new. The production model will be a unique fully faired retro-modern motorcycle. This year’s EICMA show witnessed yet another unique motorcycle, the MV Agusta Superveloce 800. The just-debuted motorcycle is actually in its concept form and the production version is planned to be manufactured in the second half of 2019. Once the motorcycle hits the market, it will be the only one of its kind in the fully faired retro-modern segment. 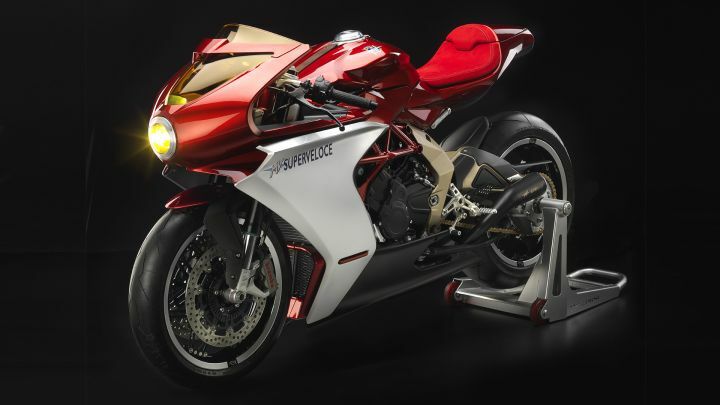 Just like other faired motorcycles from the Italian firm, the fairing in the Superveloce 800 has elegantly designed clean lines, with two intakes flanking the headlight. But this design theme is limited only to the lower portion of the fairing. The upper portion on the other hand is inspired from the design ethos of the 1970’s. It may sound paradoxical, but MV being MV, has done a superb job of seamlessly blending the two design languages into one. The headlight fairing is curvaceous yet aerodynamic and features a plexiglass windshield. Both the windshield and circular LED headlight come with yellow lenses, which enhance the vintage appeal. An LED DRL peers through the windscreen, mounted behind the new instrument console. Another steampunk-like element is the leather strap that runs across the length of the fuel tank. The tail section too gets a shapely cowl that ends with a circular LED tail light at the centre. MV Agusta says the pillion cowl can be removed to convert the motorcycle into a twin-seater but we feel it’s best to keep it on as it makes the design much more fluid. Moreover looking at the tail section, pillion seat comfort doesn’t seem to be something MV Agusta had in their mind. Powerplant is likely to be a tuned version of the Brutale 800, which is a 798cc inline three-cylinder liquid-cooled engine. The Brutale 800 produces 110PS of power and 83Nm of peak torque and is mated to a 6-speed gearbox. The frame looks identical to the trellis unit in the Brutale 800 but the Italian motorcycle manufacturer has used a new subframe at the rear. Its uniqueness is further accentuated by the single-sided swingarm. Suspension up front could be the same Marzocchi upside down forks that does duty in the Brutale 800. The monoshock at the rear isn’t clearly visible to figure out whether it’s all-new or the same Sachs unit from the Brutale. Brakes include dual front discs with Brembo radial calipers and a single rear disc. It’s interesting how they’ve constructed the wheels: the rims get notches grouped into five, in which the spokes are attached, giving it a distinct star-shaped pattern. The wheels are shod with Pirelli Supercorsa rubber.